The proliferation of open-enrollment schools in New Orleans means parents can choose where their children are educated, no matter where they live. But when it comes to getting those kids to and from school, that freedom of choice comes with a price for schools. The cost of busing students to New Orleans’ public schools has risen by about 67 percent since the school year before Hurricane Katrina, when it cost $18 million. This year, it’s $30 million, although there are fewer students and schools now. That increase appears to be driven largely by the transition from neighborhood to open-enrollment schools and from a unified system to a network of independent charter organizations. Before Katrina, most New Orleans students went to school in their neighborhoods. In 2004-05, they traveled an average of 1.9 miles to school, according to the Cowen Institute for Public Education Initiatives. In 2011-12, that was up to 3.4 miles. And most students — 86 percent — didn’t attend the school closest to home. So while many students could walk to school before the storm, now buses shuttle them across the city. Martin Behrman Charter School Academy of Creative Arts and Sciences, located near Algiers Point, picks up students in eastern New Orleans. Meanwhile, Sarah T. Reed High School, a traditional public school located in eastern New Orleans, carries students from the West Bank. Most of the 87 public schools in New Orleans — charter schools and those run directly by the Orleans Parish School Board and the Recovery School District — provide transportation to their students. They do that by contracting with bus companies, providing passes for public transportation or even buying their own fleets and hiring drivers. These costs aren’t spread evenly among the city’s public schools; some budget nothing for transportation and several plan to spend more than $1,000 per student enrolled. At a few schools, transportation accounts for more than 15 percent of this year’s budget. One reason for the range: Depending on their charter agreement or district rules, some schools may not have to provide transportation. Even if they do, at some schools more parents may drive their kids back and forth. And some schools have more special education students, who cost more to bus because they require assistants and have to be transported in smaller groups. “We are almost a district now of districts,” said Debra Vaughan, an economist and researcher for the Cowen Institute. At a recent roundtable discussion on student transportation, she noted the impact of school choice and a decentralized school system on student busing — not just the cost, but travel times and the effect of transportation on truancy. Kindergartner Am'marie Watkins walks off the bus at John Dibert Community School, one of the charter schools that takes kids from around the city. FirstLine Schools, Dibert’s operator, also handles busing for the Recovery School District’s direct-run schools. About a dozen transportation companies bus students in New Orleans. Each charter organization arranges its own transportation, perhaps working with more than one company if it has several schools. And the Recovery School District and the Orleans Parish School Board arrange transportation for their direct-run schools. Even charter schools that share buildings arrange transportation independently. ENCORE Academy and Crocker College Prep share the same Uptown building, but not busing services. Crocker pays $1,050 per student using Hammond’s Transportation; Encore uses Apple Bus Company and pays $785 per student. “Better coordination between schools and more competition amongst transportation vendors could help achieve some savings,” the Cowen Institute said in a 2010 report. Ben Kleban, founder and CEO of New Orleans College Prep, the charter organization that runs Crocker, said the two schools haven’t tried to coordinate busing. “Even if we did share busing, there are still different cost drivers at each school,” he said. For instance, more kids at Crocker take the bus, and the school provides a second round of busing every afternoon once after-school programs are finished. In order to keep costs down, some charter networks use the same bus for two routes. A bus picks up kids for one school, delivers them and goes back out for another school. The downside, however, is that some children have to be at their bus stop as early as 5:40 a.m. if they live far away. At some schools, bus service represents their second highest expense after personnel costs. Schools overseen directly by OPSB and the RSD tend to spend more per student on busing than those run by individual charter organizations. The four schools that spend the highest percentage of their budgets on transportation are OPSB direct-run schools, all of which use Durham School Services. The Lens obtained this year’s projected enrollment figures and the transportation budgets for every school, some preliminary and some approved by the board. For the 11 schools directly run by the RSD and OPSB, The Lens used spring 2013 enrollment. Those figures were used to calculate transportation cost per enrolled student, which is the same method used by the state. Costs have risen for some schools in recent years. 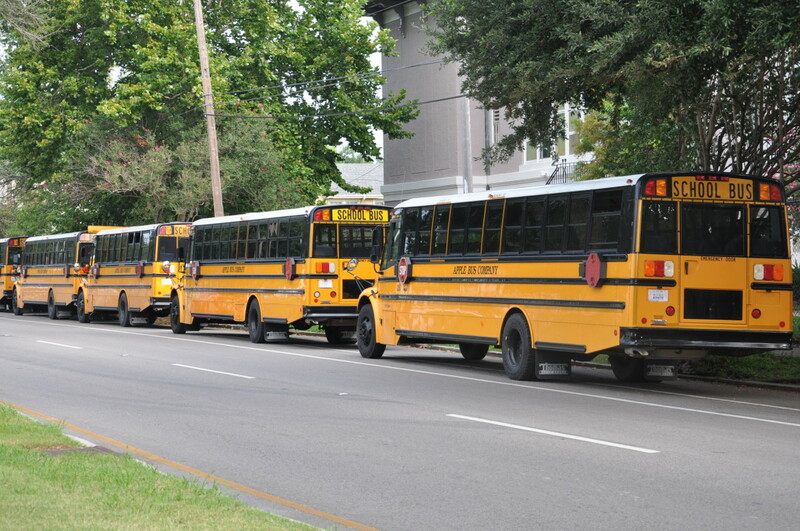 In the 2008-09 school year, the Orleans Parish School Board paid $947 per student to transport students to and from its five direct-run schools. That jumped to $1,061 in 2010-11, also for five schools. Today, transportation averages $1,106 per student for OPSB’s six direct-run schools. Based on preliminary enrollment figures, the Recovery School District plans to spend about $1,290 a student on transportation for five direct-run schools. RSD spokeswoman Zoey Reed pointed out that RSD has a large number of special-education students. About $613,000 of RSD’s $1.5 million in transportation costs is for them. It’s hard to compare state and local transportation data because of the lag in statewide figures. But one piece of comparable figures shows what’s happening: Per-pupil busing costs rose 10 percent for OPSB’s handful of direct-run schools from the 2010-11 school year to the next. Statewide, it rose 3 percent. Adrian Morgan, CEO of the Algiers Charter Schools Association, said the high costs of transportation and early bus stop times across the city are simply a result of logistics: the river, traffic, where students live and citywide school choice. He said the network works closely with its bus company, First Student Inc., to work out the routes and adjust them if students move during the school year. “It is a little bit of a chess game and very complicated in terms of trying to get it right,” he said. Fannie C. Williams Charter School expects to pay nearly $1,200 per student this year. Watson told The Lens that the school, with a projected enrollment of 535, uses two or three buses for special-education students and more than 10 buses for the rest. About a fifth of the city’s households don’t have a car, according to 2011 Census data. Though most schools spend between $500 and $1,000 per student, some schools spend far more — or practically nothing. Edward Hynes Charter School has budgeted just $79 per student on busing, less than 1 percent of its budget. Principal Michelle Douglas said that’s largely because many students live nearby in Lakeview and walk or ride bikes to school. Many also participate in after-school activities, so their parents pick them up. Two schools have budgeted about 2 percent of their expenses for transportation. Sophie B. Wright Charter School will spend about $204 per student; the school owns its fleet of buses and employs the drivers. Dr. King Charter School, which contracts with First Student Inc., will spend just $229 per student. Meanwhile, Mahalia Jackson Elementary School, one of OPSB’s direct-run schools, is projected to spend $1,604 per student on bus services this year. When asked what could be responsible, a school employee referred The Lens to OPSB; no one responded before publication. Benjamin Franklin High School and Warren Easton Charter High School, both OPSB charters, took different tacks on transportation after Hurricane Katrina. “We have a long tradition of not supplying busing,” said Timothy Rusnak, Ben Franklin’s CEO. The school prefers to put that money into teaching, he said. Ben Franklin provides Regional Transit Authority tokens and transfer tickets to any student who requests them. The school budgeted $25,000 this year for transportation, a small fraction of its budget. Rusnak said the school is open at 6:30 each morning and stays open for 12 hours — sometimes longer — in part to accommodate parents who take their kids to and from school. Across town at Warren Easton, the school will spend $675,795 on transportation, 8.1 percent of its budget. That works out to $735 per student compared to Franklin’s $29. Warren Easton Principal Alexina Medley said the RTA’s routes don’t reach all of her students. Lake Forest Elementary Charter School also has decided not to bus students. The school provides RTA passes to students who qualify. As a result, the school has budgeted just $6 per student for transportation. Some schools, such as Warren Easton and Bricolage Academy of New Orleans, have aggressively negotiated with the bus companies in town. There are signs of collaboration, too. The Algiers Charter School Association, which runs six schools, still handles busing for two schools that are now operated by a new charter operator, InspireNOLA. And for its five direct-run schools, RSD has contracted busing through FirstLine Schools, which also operates five schools. This year, FirstLine Schools signed a contract with Apple Bus Company, which brought the Kansas-based transportation business to town. Apple Vice President Reid Oyster said he is looking forward to the challenge of routing buses through a new city with ever-changing enrollment and population. This story was changed after publication to add Ben Kleban’s comments about transportation costs at Crocker College Prep. Former Miller-McCoy principal canceled a bus contract, then awarded it to her brother without authorization.